Star Wars 'Star Destroyer' Ring is Probably Not For The Financially Responsible | OhGizmo! By Randy Donack on 11/15/17 • Leave a comment! How much do you love Star Wars, a lot? 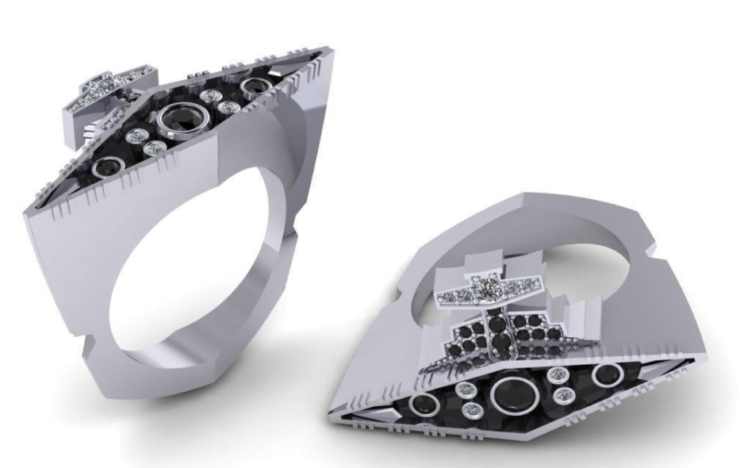 Enough to buy a $450 ring designed to look like a Star Destroyer? Because that’s what geek.jewelry is offering to the biggest and least fiscally responsible Star Wars fans. I have to say, the ring actually looks really great, and it’s available in combos of Sterling Silver/Cubic Zirconia all the way up to 14k White Gold/Diamonds. You’d have to be a serious fan to want to spend this much on a piece of Star Wars jewelry though. Like, ‘I know all the words to the original trilogy’ serious. Or, ‘I only watch the movies on original VHS, because it doesn’t have any special effects added’ serious. Or even, ‘I’ve sent death threats to George Lucas over his handling of Jar-Jar Binks, and last year I was convicted of felony harassment, but had my sentence lessened because I cried like hell and told the judge I was super sorry’, serious.